Song birds, deer, elk and small rodents carry the Borrelia burgdorferi bacteria responsible for Lyme disease in their bodies. When ticks feed on these animals they in turn become carriers of the bacteria. On the hook for the transfer of ticks carrying lyme disease, migratory birds visit Vancouver Island every spring and summer. Song birds which feed off the ground or in low shrubs drop off and pick up ticks. Ticks get real active during the months of spring, summer and fall. They still feed in the cooler months just not as often. Contrary to popular belief, ticks don’t fall from trees. They reside in the lower sections of brush and grasses. They may however fall from a bird or animals in the trees. Although the odds of this occurring are slim, some report this taking place. Rodents, pets, deer and elk who live in the bushes and grasses, carry ticks left by birds. They in turn transfer the ticks onward. Campers and hikers come into contact with ticks during spring, summer and fall. Mostly by rubbing up against the medium the tick resides on. The ticks carrying lyme disease will feel their prey with their front legs. Then they attach themselves to the subject and climb to open skin to feed. Vancouver Island reported cases of Lyme Disease were less than 1% over the last 13 years. This includes 37 reported cases between 2003-2016. Data shows that 50% of all cases in Canada do not get detected. This number is decreasing with the education and political changes taking place currently. Reports of campers getting Lyme Disease did occur in 2018. I know someone bit by a tick while hiking the West Coast Trail. She found out when the symptoms of Lyme Disease became painful (8 mos). Ticks carrying Lyme Disease are serious business. The disease can cause serious health issues which will affect your quality of life. Untreated it can sometimes be debilitating. The Center For Disease Control (CDC) in the US reports over 30,000 new cases of Lyme Disease every year. The number of reported cases grows larger in Canada every year also. This is in part due to migratory birds that contract ticks from the US and transport them into Canada. In 2009, Lyme Disease became nationally notifiable in Canada. The reported cases of the disease continue to increase from 0.4 to 2.6 per 100,000 population. On Vancouver Island the reported cases has stayed low overall, but seem to be growing. According to recent data, the number of reported cases increases every year. Borrelia burgdorferi bacteria (borreliosis) is the reason for Lyme Disease. An inflammatory reaction is the result. Birds, deer, elk and small rodents are the usual carriers of Borreliosis. Lyme Disease is the most common type of tick born disease in Canada and North America. There are at least 19 species of borreliosis which cause Lyme Disease. Compared to various levels of severity in flu virus’ there exists many harmful levels of Lyme Disease. A new strain borrelia genomospecies 2 just discovered on Vancouver Island resides in ticks feeding on eastern cotton tail rabbits. If you don’t detect Lyme Disease early it spreads and goes into hiding. Thus manifesting symptoms months even years after infection occurs. This lends to the confusion and tough time getting immediate and proper treatment. When ticks bite they leave a saliva mixture with the borreliosis to disguise it against the human immune system. Tick saliva serves many tasks. It numbs the bite area thereby hiding its feeding motion and prevents inflammation to keep the blood flowing. During the feeding the tick injects saliva over and over until done. No organ or system in the body can protect itself from Lyme Disease. This corkscrew-shaped spirochete organism created an unusual way to evade the immune system. It also learns how to survive against aggressive treatments. 20 to 50 percent of all patients test negative for Lyme Disease. Our body won’t release antibodies to disarm it because the spirochete can hide so well. Therefore our body doesn’t know it is in our system until after a period of time. Co-infections impede the symptoms of the disease, especially diagnosis and treatment. 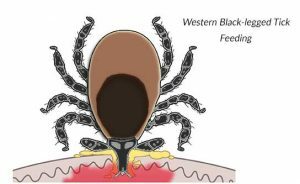 Its possible for ticks to carry and transfer one of the co-infections and not Borrelia. Diagnosis becomes difficult, often elusive for Lyme Disease because of co-infections like Anaplasmosis, Babesiosis and Rocky Mountain spotted fever. During the early stages of Lyme Disease, roughly 80% of infected people (90% children) get a visible rash. The cutaneous erythema migrans (EM) rash appears within 7-30 days of an infected tick bite. It starts at the bite and expands outward sometimes reaching 30 cm. The rash feels warm to the touch but doesn’t always itch or inflict pain. The rash sometimes looks like a bullseye. Symptoms like arthralgia, fatigue, fever, headache and myalgia sometimes accompany the EM rash. Ticks are arachnids meaning they have eight legs with separate head and bodies similar to spiders and scorpions. With over 900 species of ticks in this world they come in all shapes and sizes. Western Black-legged ticks are the most common type of ticks carrying Lyme disease on Vancouver Island. 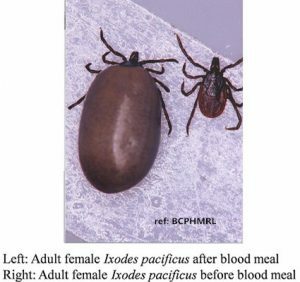 Two other ticks also recorded on Vancouver Island, show up with less frequency. All three can carry the Borrelia burgdorferi bacteria. I. angustus (no common name), I. pacificus (Western Black-legged tick), I. spinipalpis (no common name) live on Vancouver Island. The Western Black-legged Tick lives on temperate and damp vegetation. Ticks survive everywhere on Vancouver Island and the Gulf Islands. Western Black-legged ticks have roughly 100 distinct types of bacteria associated with them. It’s probable a relatively small number of the bacteria can cause harmful results. However, some of them may also prevent other disease bacteria from causing illness. Ongoing research will decide the grounds of this basis. However not all Western Black-legged ticks carry Lyme Disease. Therefore the chance of catching the disease isn’t a given. Moreover only the nymph and adult stages of the Western Black-legged tick can transfer the disease to its host. When the nymph or adult ticks attach to their host it takes at least 24 hours to transfer a disease. 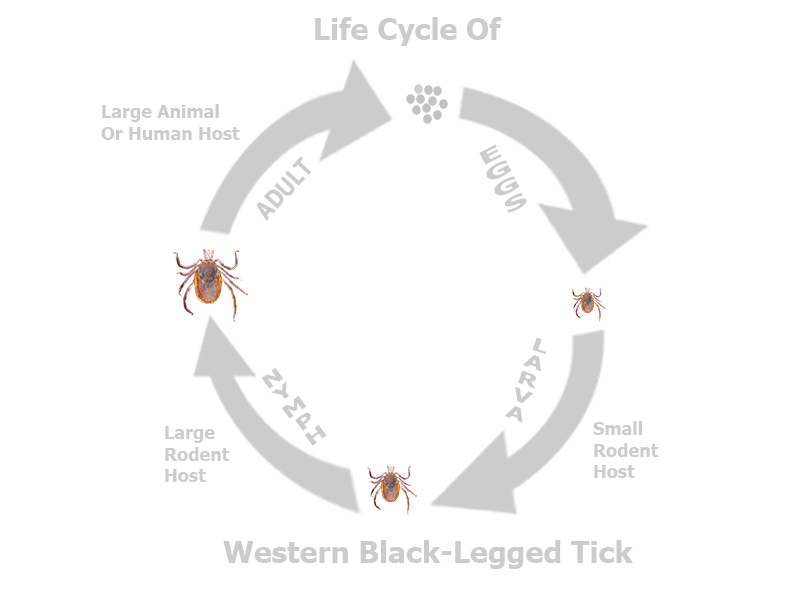 The life cycle of Western Black-legged ticks consist of 4 stages, eggs, larva, nymph and adult. The tick will endure three years before reaching the end of its life cycle. From the larva stage to adult the time line takes one year for each stage. The tick requires a blood meal before moving on to the next stage of life. Ticks must prepare their bodies for the large amount of blood needed to advance to the next stage. Ticks feed by biting animals and humans then slowly drawing blood. 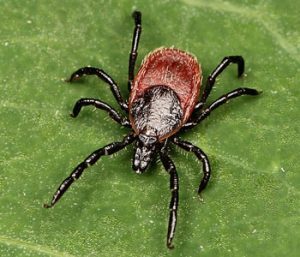 As ticks feed, their bodies become engorged to take in the blood meal. Depending on the stage of life they are in this feeding can take several days. During this feeding the tick may ingest the pathogen Borrelia burgdorferi which causes Lyme Disease. Ticks pass it along to their next food source including humans. Once done feeding, the tick will fall off in preparation for its next life stage. The most important thing to remember is to remove all of the tick. You must also do this gently so you don’t trigger the tick to discharge it’s stomach contents into your bloodstream. If you have access to rubber gloves use them. Don’t touch the tick at all with your skin. Gently remove a tick embedded in your skin with tweezers. Firmly grasp the tick’s head without squeezing and pull upwards. Once removed, clean the infected area with antiseptic solution and place the tick into a sealed bag. Use a felt pen to write the date, name and address of person bitten. Include where on the body the bite occurred and the part of the province the incident took place. If you can, also include the name and address of your physician. Transfer the sealed bag (with a moistened cotton ball) to your local physician or health clinic. Do not use gasoline, grease, heat or any other substance to remove the tick. This will only cause the tick to discharge its stomach contents and increase your chance for infection. Go see your doctor if you find the tick embedded deeper than its head. Try to walk on cleared paths only when encountering small shrubs or tall grass. Always wear light colored clothing to enable a better contrast for sighting ticks. Tuck in your shirt and tuck pants inside your socks or boots. Use insect repellent with Deet on all uncovered skin. Always check each other for ticks after camping or hiking in areas know for them. Don’t stop looking after finding one tick as there usually is more. Make sure to check your pets for ticks also after an adventure outdoors. Ticks carrying lyme disease also prey on your pets with dogs and cats being the most common. You should always check your pets for ticks on a regular basis. If you find a tick on your pet try to remove it. Use tweezers for best results. Carefully grasp the tick by the head and gently pull up without twisting. You don’t want to break off or squish the tick which could possibly transfer bacteria. Not all ticks carry Lyme Disease but you should always assume they do and save the removed tick. Place the removed tick into a sealable plastic bag or container. Add a moist paper towel or cloth to allow for accurate test results. Give the sealed tick to your veterinarian asap. If you witness any of these signs consult with your veterinarian immediately. Lyme Disease cannot transfer from pets to humans. Incidentally ticks can climb onto humans from their pets. Right now there is a push on to educate our medical system of the reality of Lyme Disease. There’s a lack of knowledge and diagnosis of this disease in Canada that needs addressing. 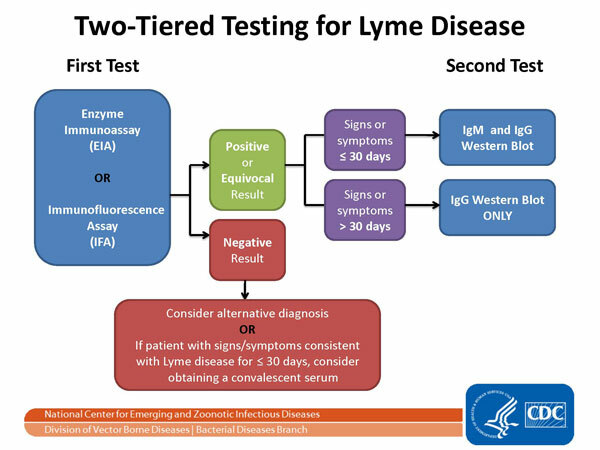 The tests used don’t do a good job of identifying Lyme Disease. Partly due to the excellent mechanisms in place for the disease to hide from the human immune system. Futhermore the lack of acceptance contributes to the problem. In Canada patients still hear that you cannot contract Lyme Disease in this country. This only highlights the need to develop an education system for the medical field in Canada. 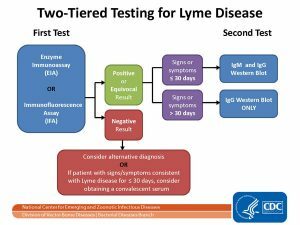 Two tiered testing determines whether Lyme Disease exists in your body. The first, Enzyme-linked Immunosorbent Assay (ELISA) screens for the disease. Western blot then confirms Lyme Disease. Resembling a bar code, the western blot compares a pattern defined from your blood to a pattern of confirmed cases. These known cases of Lyme Disease meet the requirement of the CDC to prove Lyme Disease exists. Download your copy of “Understanding the Western Blot” by Carl Brenner in pdf form. These two widely used tests measure your antibody response to the infection, not the infection itself. Hence the many negative results with these two tests. A third test, Polymerase Chain Reaction (PCR) reproduces DNA from the Lyme bacteria allowing detection. Furthermore although very accurate, PCR produces many false positives because of the Lyme bacteria’s ability to hide. Watch the video below of a young girl living infected by Lyme Disease. Witness her attempt to convince Ottawa to address the issues. Also sign the petition set up to add your voice to the cause. Ticks carrying Lyme Disease on Vancouver Island are real. The incident rates are growing every year. Unfortunately most cases of Lyme Disease go undetected because of mis-diagnosis. Lyme Disease is becoming a pandemic in North America. Governments are behind in addressing the implications of Lyme Disease. Consequently a year ago the Canadian Federal Government announced 4 million dollars to fight Lyme Disease. Much more education will help to slow down this disease and alleviate the issues in diagnosis. The general public needs to keep reminding their local governments about Lyme Disease and the need for more action. Vancouver Island has had very few cases of Lyme Disease but that is changing. More and more songbirds are migrating north into British Columbia from California where ticks are abundant. When removing ticks remember to do so gently so you don’t squish the tick or separate the head from the body. Always try to save the tick and give to your physician or veterinarian for testing. Finally, always be aware of ticks in the outdoors even when gardening or playing in your own yard. Because they’re not just in the forest, they’re everywhere grasses and shrubs grow. Great Article. Lots of information here. Thank you for helping bring awareness to the masses. I contracted Lyme Disease Summer of 2017 and have been fortunate enough, to be able to find a Naturopath who is treating me sucessfully, but it is expensive and a long haul. We need the medical association to get on board with, first of all believing this is a big problem, having an open mind about different treatments and then getting proper testing and treatments in place to help those who are infected. Hi Terri, thanks for your comments and best of luck to you with your battle. I hunted deer on VI until I became aware of Lyme disease. I would dress out the deer on a new white tarp and see many ticks leaving the carcass. While dressing out the deer ticks would crawl on my disposable clothing. I thank my Dear Wife for checking me for ticks after a shower. I gave up hunting because of tick infested deer. Many hunters do not use a white tarp to check for ticks and do not take precautions to prevent bringing them home. Hi KGL, thanks for your comments. Very good advice for those who hunt wild game. I have a few friends who also use a white tarp or a white pair of coveralls when dressing their game.